Turn your Pocket PC into the ultimate navigation system! 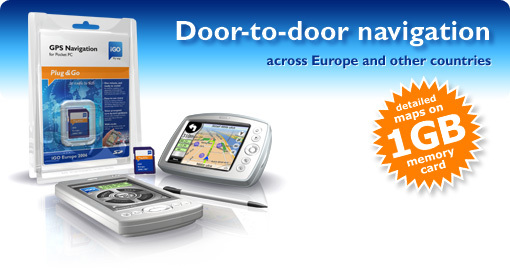 The iGO GPS navigation software helps you reach your destinations quicker and easier than ever before. Whether you use it in heavy metropolitan traffic or out in the countryside, iGO will always show you the right way. It only takes one minute, and iGO is ready to cruise! All you need is a PDA running Microsoft Windows Mobile and the iGO Europe 2006 | SD memory card. As a result of the revolutionary new technical solutions the detailed map of Europe is held by a 1GB memory card. There is no need for installing the software, for downloading maps or for registration via the Internet; you can start searching for specific addresses or planning routes right away. If you have a GPS receiver, you can also benefit from all the features of the software such as voice prompted turn-by-turn navigation and more. Thanks to the easy-to-use user interface and high-accuracy digital map, iGO adds pure joy to your navigation experience. map spain will be here soon. Just put in root folder on SD/CF card and run install.